SEPARATORS: Two phase separators are utilized to separate the gas from the liquid in a well stream. This allows liquid free gas to be diverted to gas sales and/or to be utilized as fuel. Relatively gas free oil is then dumped to storage or to a treating system for removal of water. TWO PHASE SEPARATORS: Designed specifically for oil and gas. The well stream enters the separator and strikes a inlet deflector which diverts the liquid and gas downstream to the liquid section where it begins to separate. After adequate retention time, liquid builds up in the bottom of the tank and lifts a float, through a linkage to dump the fluid. THREE PHASE SEPARATORS: Designed specifically for oil, gas and water. Essentially the same as a two phase except the separator has an internal inlet downcomer, which carries the fluid to the bottom of the vessel for added retention and separation time. Vertical separators are designed primarily for intermediate gas-oil ratios, while horizontal separators are suited for high gas-oil ratios and constant flow well-streams. These high-pressure separators are available in vertical or horizontal configurations, with a wide range of sizes and capacities. At ACS Manufacturing we specialize in filling the needs of the petroleum industry, with products designed to withstand the rigors of oil and gas production. 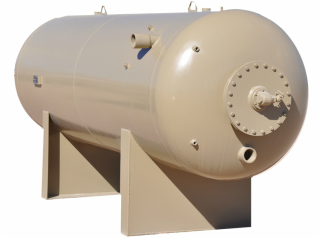 We understand that the ability to separate oil, gas, and water in oilfield operations is critical; that’s why we provide a wide range of robustly engineered 2 and 3 phase separators. 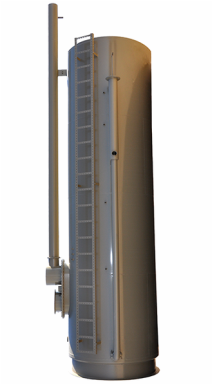 VERTICAL HEATER TREATERS: Features include; large diameter gas separation section for increased removal of entrained liquids, mist eliminator to assure dry outlet gas, full diameter free-water knockout section for removal of free-water with a minimum of heating, and to assure clean discharged water and more. The well stream enters near the top of the vessel (inlet) and strikes the inlet deflector. Centrifugal action and retention time combine to allow natural gas to separate from the liquid. The gas exits the top of the vessel while the oil and water emulsion descend to collect beneath the firebox. Free water separates from the oil and drains to the storage tank. The spreader breaks up the remaining emulsion to remove any residual water. Treated oil then flows through the heat retaining baffle and exits near the top of the vessel. FREE WATER KNOCKOUT: The Free Water Knockout is designed to economically separate a portion of the water in a well stream from the oil. The vessel has a large interface whichallows the maximum amount of free water to settle out. The primary application is to reduce the water load on a treating system where large amounts of water are present. Free water knockouts have an application where the treating system is atmospheric yet under pressure to dump the water. PROJECT INSPECTION -- ACS Manufacturing welcomes customer source inspections as an addition to our internal material and quality control inspections. Our internal inspection and quality assurance department is constantly striving to insure the highest quality output in the industry. We make office space, phone, fax, e-mail service and all quality records available to outside inspectors giving them access to all manufacturing areas. SAFETY -- Working safely and ensuring safe working conditions are primary objectives for everyone from top and middle management to the line workers. Engaging in weekly, monthly, and annual safety audits, we work to consistently train and improve at ACS Manufacturing. QUALITY CONTROL -- ACS Manufacturing quality control manual is available for any operator to review and audit insuring the highest quality available in the industry. Quality control begins in engineering, continues through fabrication, and is validated in testing and customer approval. Upon receipt each piece of raw material is inspected for compliance with purchase order requirements and engineering’s bills of materials.